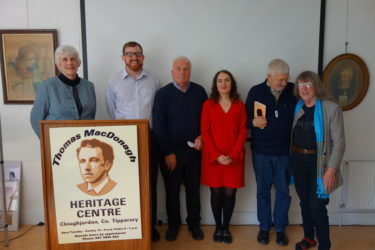 The legacy of Thomas MacDonagh was honoured in Cloughjordan during the annual May bank holiday weekend through reflection on the Irish language, the Gaelic revival and Joe MacDonagh and the 1918 general election. The opening night belonged to the pupils of Cloughjordan No. 1 and St Michael’s National Schools. Their project on Cloughjordan’s story of emigration to Canada was on display throughout the Thomas MacDonagh museum. Dylan Wallace and Senan O’Brolchain presented excerpts from the project. Guests of honour were Mr Charles Corbett and his daughters, Diane and Jane, who travelled from Ontario to attend the weekend events. An open letter to the Children of Cloughjordan from author Judith Colbert, whose ancestors emigrated from Stoneyacre in 1830, was read by Rachel Vaughan. Those who attended the Saturday Summer School were rewarded with three excellent talks by speakers who were passionate about their topics. Through a family connection Dr Máirtín Mac Siúrtáin provided insight into Grace Gifford’s life, presenting original material. Extensive research by Gerard Shannon on the youngest of the MacDonagh family, Joe, gave an in-depth portrait of his political development and activities leading to his untimely death in 1922. Catherine Morris’s engaging presentation of the dynamic dramatist of the Gaelic Revival, Alice Milligan, left those present with a memorable image of this poet and educator whose work was much admired by Thomas MacDonagh. The Sunday afternoon talk was presented by John Walsh; whose research on those who speak Irish, though not from the Gaeltacht, gave rise to an interesting discussion. 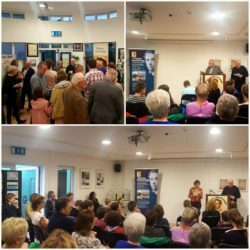 Sean Hogan’s illustrated talk presented the contributions of the elected politicians who carried Tipperary through 1916 to the first Dáil Éireann. The contribution of both speakers expanded on the main topics addressed in 2018. 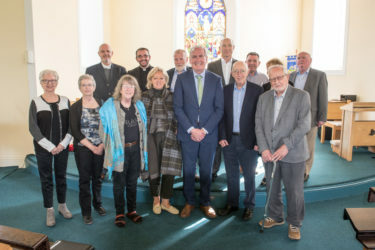 A special event was held in St Kieran’s Church commemorating the bi-centenary of the Talbot Expedition and the following local emigration to Canada. It began with commemorative prayers led by Rev Terry Mitchell, Rev Shannon de Laureal and Fr Michael Gerrity. The presence of the Canadian Ambassador to Ireland, Mr Kevin Vickers, honoured this event. In his address he spoke of the pathos of emigration for the families who had left in difficult times. Specific families were brought to mind by speakers: Clifford Guest, Roger Downer, Simon Ó Croinín and Seamus Costello while the tragedy of famine victims arriving in Grosse Ile was recalled by Jim Minogue. The event concluded with a reading of Judith Colbert’s letter by Leontine Friel Darrell, whose father Bruce was born in Ontario. The Heritage Group is grateful to all those who shared a wealth of talent at the ever-popular Rambling House, organised by Bawney Hayes: Michelle and Andrew Drysdale, the McGrath Family, Tom Williams and Patsy Reddan, Maggie McGinty, Patrick Bergin, Holmes Family, Leslie-Ann Ryan, Orla Kelly, Kevin McDonald and Pat Foote, Cloughjordan’s Trad Group, Peadar Walsh and Kilruane Musicians and Máire Hanly. Lean an ceoil, caint agus caidhreamh an oíche dar gcionn ag an Oíche Ghaelach. The Writers Group gathered, with guests, to read their original writings and on the final day, in glorious sunshine, a large group enjoyed the afternoon exploring Scohaboy Bog, following a presentation by Gearóid Ó Foighil. A special word of thanks and praise to those who baked and helped with hospitality throughout the weekend. The Cloughjordan Heritage Group is grateful for the continued support of Tipperary Co. Co. which has enabled this annual event to take place during the past ten years.